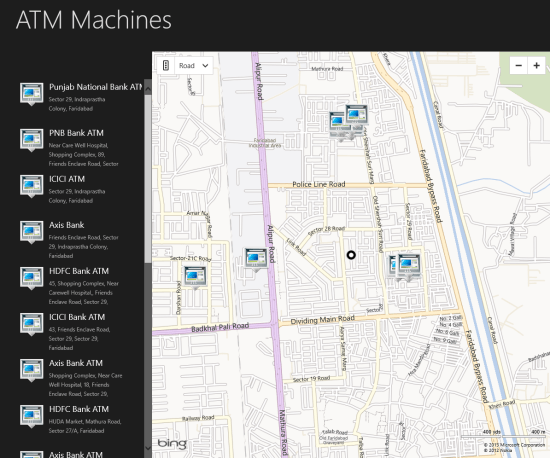 ATM Machines is a free Windows 8 app to locate ATMs nearby. It can prove quite handy in locating ATMs nearby. Suppose you went to a new place and suddenly felt shortage of cash. In such situation you can utilize ATM Machines Windows 8 app for finding the ATM locations within your reach. The best part is that you are provided with a detailed map to find your path to the ATMs. On launching this Windows 8 app to locate ATMs nearby for the first time, you will be prompted to allow the application to access your Location. To proceed you will have to click on ‘Allow’ button. 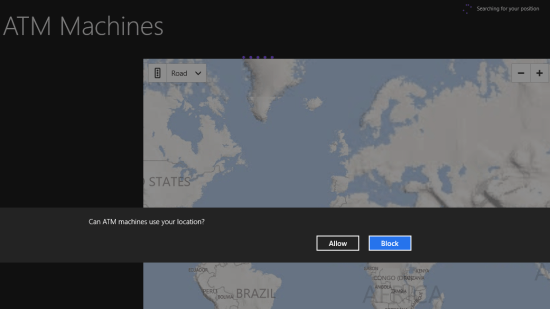 Then this free Windows 8 app will converge the map to your current location depending upon the input from GPS sensor in your PC or by using your network information. In a matter of few seconds a similar interface will be presented to you as in screenshot below. The default view of the map is ‘Road’, but you can switch to it ‘Aerial’ or ‘Bird’s Eye’ at anytime by using the dropdown placed on the top-left section of the map. Need not to mention that you will be able to zoom-in, Zoom-out, and drag the map as per requirement. Also, check out our posts on SAT Exam App, Win Maps, and Apps To Book Hotels. You can locate ATM Machines app under ‘Finance’ section of Windows 8 store. To install ATM Machines Windows 8 app you will require opening this link in Internet Explorer 10 or Advance. Next, click on ‘View in Windows Store’ button. Then upon being redirected, click on ‘Install’ button. The size of the app is only 4.17 MB in size and will install without taking much time. * The app requires permission to access your location and Internet connection. ATM Machines is a very nice windows app. It is a must to have on your Windows 8 machine. I recommend it wholeheartedly.